This book presents the majority of the contributions to the Tenth German-Vietnamese Seminar on Physics and Engineering (GVS10) that took place in the Gustav- Stresemann-Institut (GSI) in Bonn from June 6 to June 9, 2007. In the focus of these studies are the preparation and basic properties of new material systems, related investigation methods, and practical applications. Accordingly the sections in this book are entitled electrons: transport and confinement, low-dimensional systems, magnetism, oxidic materials, organic films, new materials, and methods. The series of German-Vietnamese seminars was initiated and sponsored by the Gottlieb Daimler- and Karl Benz -Foundation since 1998 and took place alt- nately in both countries. These bilateral meetings brought together top-notch senior and junior Vietnamese scientists with German Scientists and stimulated many contacts and co-operations. Under the general title "Physics and Engine- ing" the programs covered, in the form of keynote-lectures, oral presentations and posters, experimental and theoretical cutting-edge material-physics oriented topics. The majority of the contributions was dealing with modern topics of material science, particularly nanoscience, which is a research field of high importance also in Vietnam. Modern material science allows a quick transfer of research results to technical applications, which is very useful for fast developing countries like Vietnam. On the other hand, the seminars took profit from the strong cro- fertilization of the different disciplines of physics. This book is dedicated to the tenth anniversary of the seminars and nicely shows the scientific progress in Vietnam and the competitive level reached. 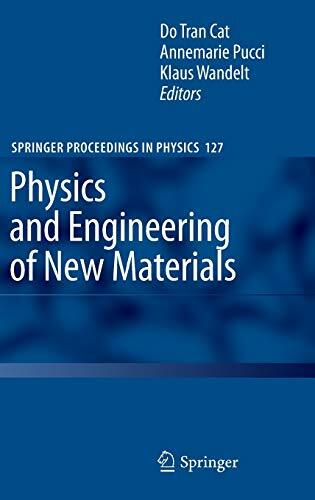 Under the general title "Physics and Engineering of New Materials" the book covers experimental and theoretical cutting-edge material-physics oriented topics such as new materials, magnetism, nanostructures, surface physics, carbon nanotubes, photonics, biophysics, large-scale simulations, etc.